SOMEBODY put a big X on my face! So yesterday in Lit Chat, we were discussing Ugly Duckling stories. I confessed that I was very much an U.D. as a child and had photo proof. 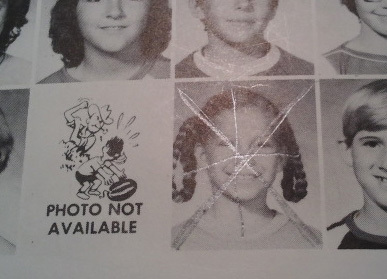 I don’t know what possessed me to try this modified Princess Leia hairdo on picture day (the pin in the coils hurt, so I went with them down), but I got ridiculed for it. It’s something I’ve never forgotten, but even though people called me “Dog Ears,” I wasn’t particularly scarred by it. I broke out the 1980s era yearbook to scan the picture for LitChat. And found this. Unlikely suspect. I wouldn’t have let him touch my yearbook after our Big Breakup anyway. But in thinking about it, I am quite sure I didn’t see the X marking my spot at the time, which means it could only have been done after the fact. Someone in my own home. Wait, did I say trusted? Scratch that. I seem to recall my yearbooks getting mixed up with his. Maybe he thought he was marking me out of his own book. Maybe he knew what he was doing. The yearbook is coming with me when I visit home this weekend. Watch out, baby brother.